March Madness is known for its great teams, clutch players, and exciting games, but the players themselves are often overlooked and only praised for their basketball skill. The truth is that March Madness exhibits some of the best teams, but most people fail to realize how unique some of the players are. Some have extraordinary physical talents while others have strange superstitions that must be done before games. 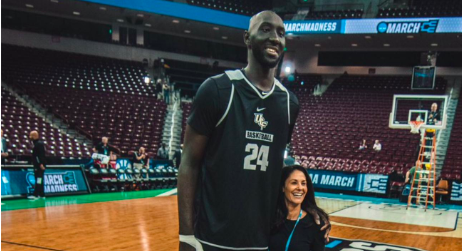 For example, Tacko Fall, the center for UCF, is 7’6”, and he is taller than any other player in both the NCAA and NBA. Another physically gifted player who blows minds is the probable number one pick, Zion Williamson. He is only 6’7”, but he weighs 285 pounds, making him the second heaviest player in the NBA behind a 7’3” center. Not only is he so heavy, but he moves like a guard and is quicker than most guards that he faces. If one wanted to be confused, just look at one of Ricky Lindo Jr.’s pregame routines. Lindo Jr. plays for Maryland and wears his socks inside out every game that he plays in. When he practices or shoots around he wears them right side out, but he needs to wear them inside out if he plans on playing in the game. Another Big Ten freshman, Ignas Brazdeikis of Michigan, has a weird characteristic of his own. He eats, throws, and brushes his teeth with his right hand, but he plays basketball and shoots with his left hand. He is right-hand dominant in all things besides basketball, which almost never occurs. Rare occurrences do not only happen in the Big Ten. Temple currently has two players on their team who used to be the team managers. Waddington and Keshgegian originally held the spots of the two managers for Temple University, but they later were rewarded with spots on the roster as actual players. It may be strange to have two managers on a team, but St. Mary’s has some unorthodox methods of their own. Of the fifteen players on St. Mary’s team this year, ten are international players. That number is the most out of all the Division one schools with the average program having around one or two international players on their roster. The players make March Madness great, but many of us fail to realize each of these players are actual people. And just like people, there is more to them than their looks and physical appearance.